This is a 4-day (Mon-Thu) workshop designed for people interested in gaining both a deeper and broader look at network theory and methods. A key objective is making connections between different network concepts, such as seeing the underlying unity behind families of measures, including those at different levels of analysis, such as measures of cohesion and measures of centrality. It is assumed that participants are familiar with UCINET and have some knowledge about network concepts. Integrating network variables and results into a larger study -- i.e., how do you use this stuff to generate knowledge write publishable papers. We will be using UCINET. Please visit our software page. Borgatti, SP, Everett, MG & Johnson, JC. 2018. 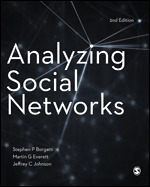 Analyzing Social Networks. 2nd Edition. Sage: London. Borgatti, S.P. and Everett, M.G. 2006. A graph-theoretic perspective on centrality. [pdf].